Dubai's Hearts are Pumping Fast! 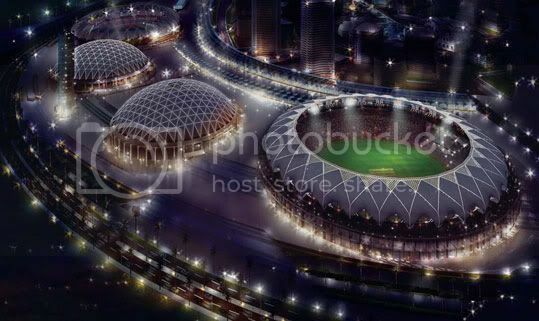 The Dubai Sports City Cricket Stadium, which will host 2 ODIs and a 20-20 match between Pakistan and Australia later this month, is one of the most picturesque cricket grounds you will ever see. Built within the ambitious Dubai Sports City project, which is part of the mega Dubai World project, the stadium's completion has been delayed by over a year. 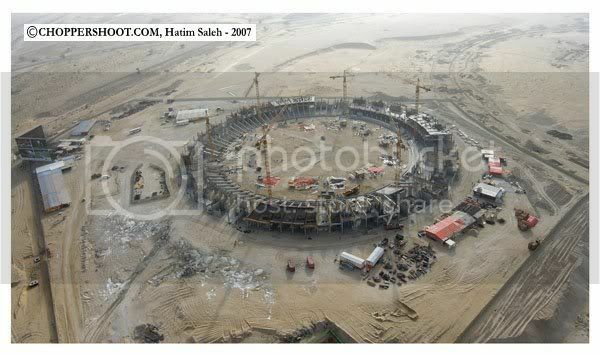 About 2 years ago this is all that was there where the stadium stands beautifully today. 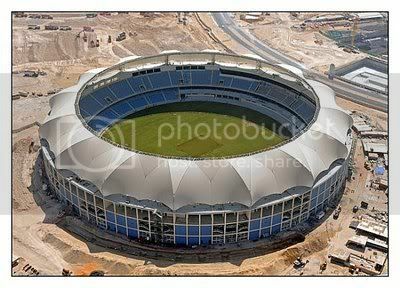 Many hard working days later the stadium has come to life. Over the last 2 days, the stadium hosted its first 2 matches with the UAE U19 team, preparing for its tour to Kuwait, playing against Lanka Lions and Fly Emirates. Pakistan coach Intikhab Alam and assistant coach Aqib Javed were also present at the ground to take a note of the playing conditions. Ask anyone and they will tell you what a "batting paradise" the Dubai wicket is. What else could one expect. On top its a nightmare for fielders. The white half-roof type top you see is where the lights are and in the artist's impression below it shows you how the ground will look at night with the lights on. Its a beauty I think. But for the fielders looking up at a skied ball amidst the lights and the white background of the half-roof, its going to be tough. Nevertheless, you can expect some gruelling constests between Pakistan and Australia here with 25,000-30,000 Pakistanis cheering at the top of their voices. The excitment for the games is at its peak these days. Tickets are selling fast and everyone is anticipating the arrival of Younis Khan, Ricky Ponting, and their men. The Pakistan team arrives here on 13th April to play a few practice games against local sides ahead of the ODIs. Fans are gearing up to watch those matches as well. While Australia who came to this part of the world last in 2002 to play a test against Pakistan are also eagerly awaited. Not many here have witnessed the Aussies live and for most it will be a first time experience. The greatest anticipation, however, is for the first ever 20-20 international to be played in the UAE. 7th May will no doubt bring together the largest and most boisterous crowd you will ever get to see here in the UAE. Pakistan and Australia - we are waiting for you! the artists impression is not entirely true, this is what i believe was during the design stage, now if my memory serves me right you have a ring of lights around the inner circumference of the white roof, it would be amazing for a spectator but as a fielder you are sure to lose the ball for split second, we'll have to see how that goes. I will reconfirm the exact type of flood lights. btw you got your tickets for the T20 already?? purple or the red grandstand? im confused as to the price difference since the view is almost going to be the same! Yeah u have already answered one of my questions I had in my recent post on MAZA786. So there seems to be a "buzz" with cricket coming to the luxurious locations. Yeah just to inform I've replied to your arguments.We seem to disagree quite alot but that's blogging ! LIB - I was at the ground the other day.. my brother plays for UAE U19.. saw the ground.. the lights are around the inner circumference as u say, which is pretty much similar to the drawing..
And its more than a split second that the ball gets lost in the air.. one of the U19 players for injured and got a cut in his face cos he lost the ball.. Aqib and intikhab were checking it out in the middle and didnt look too happy..
wouldnt miss it for anything NC.. already have my tkts for all the ODIs and the 20-20 :-).. plus i've been talking to a few guys who matter and if it works out I might just be in the press box! Ive responded Maza.. u shud have the email notification thing so that whenever u respond I get notified via email..
Oh when will international cricket come to the USofA??? There's enough support to sell out a Pak-India ODI and T20 series. Even come back to Canada - it's within reachable distance of me! I am considering returning to the Caribbean for T20 WC next year. Let's see. Need to address my cricket withdrawal syndrome! U shud see it in the USA soon Sledge..
Read that LIB :-).. I'll be there for the Dubai ones and the AD ones as well.. must meet up.. who knows maybe we have already ;-)..
i doubt if we have met in person, AD Odi's it shall be! btw have added you on facebook, initials AI. Zabardast LIB.. got the request, will confirm!